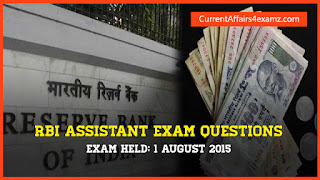 Friends.. Reserve Bank of India (RBI) today (01 August 2015) started its RBI Assistant Exam 2015. There were 05 sections in this exam: Reasoning, Quantitative Aptitude, General Awareness, English Language and Computer Knowledge. Here are the GA questions shared by our friend Rajeev. Check Evening Shift Questions from here.